Macro data subdues mkts. The benchmarking indices closed Friday\'s session on a flat note as investors turned cautious on the inflation data to be released on Monday besides US Fed stance on rate hike next week. Mumbai: The benchmarking indices closed Friday's session on a flat note as investors turned cautious on the inflation data to be released on Monday besides US Fed stance on rate hike next week. 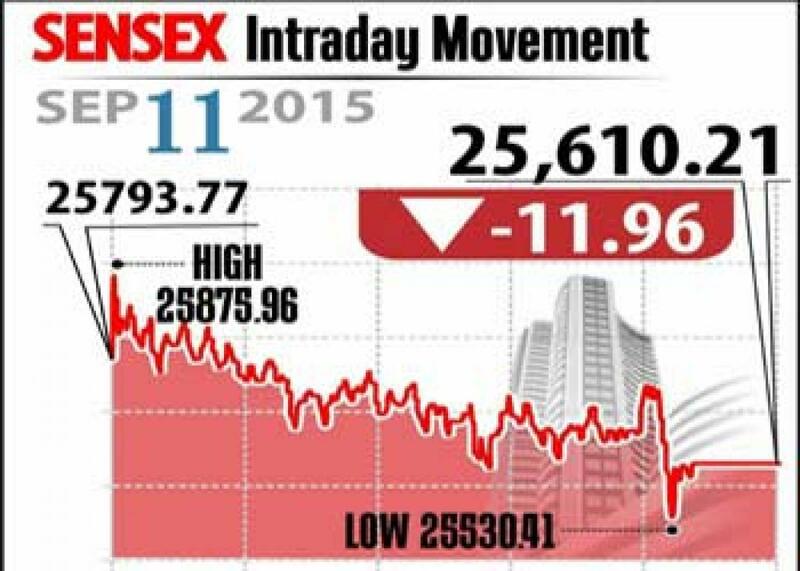 Sensex closed down 12 points at 25,610, Nifty ended up 1 point at 7,789. The broader markets, however, closed on higher note with midcap up 0.2 per cent and smallcap gains 0.6 per cent. Analysts opined that the volatility to continue till Fed meeting next week. Further, the foreign funds continue to book profits. On the sectoral front, power index hit 1.8 per cent down followed by metal, capital goods and auto indices. Also realty, FMCG and IT indices have also last. From bank space, most of the banks have declined as investors are resorting to profit taking after recent gains. ICICI Bank, Axis Bank and HDFC Bank lost while mortgage lender HDFC gained 0.9 per cent. While pharma shares ended firm with Sun Pharma, Dr Reddy's and Cipla ended up to 1 per cent each, heavyweights like RIL down 0.7 per cent, while Vedanta and GAIL closed over 2 per cent lower. The gainers: SBI, up 1.12 per cent at Rs 230.15; Wipro, up 1.07 per cent at Rs 557.30; Infosys, up 0.96 per cent at Rs 1,090.70; HDFC, up 0.88 per cent at Rs 1,174.40; and Dr Reddy's Lab, up 0.75 per cent at Rs 4,003. The losers: Tata Steel, down 3.02 per cent at Rs 233.05; Vedanta, down 2.56 per cent at Rs 97.10; Gail, down 2.48 per cent at Rs 285.05; Tata Motors, down 2.46 per cent at Rs 345.55; and BHEL, down 2.22 per cent at Rs 211.75.